Coley signed a reserve/future contract with the Jets on Saturday, Eric Allen of the team's official website reports. Analysis: Coley has appeared in seven games over the previous two seasons with both the Vikings and Jets. At 6-foot, 195 pounds, he will look to use his speed to earn a spot on the Jets' final roster next season. However, he will likely need to make an impression during training camp in order to do so. Coley (hamstring) was waived from injured reserve Tuesday. Analysis: Coley will make his way onto waivers where he will have a chance to be claimed by another team. If he goes unclaimed, the young receiver will become a free agent. 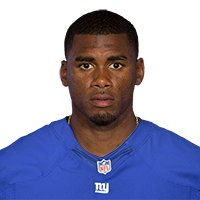 The Giants placed Coley (hamstring) on injured reserve Saturday. Analysis: Coley was scooped up by the Giants after he was waived by the Vikings following Week 2. While he is just a depth receiver at wideout, his primary contribution for the team was as a punt returner. Jawill Davis is the prime candidate to replace him there going forward. Coley is now set to spend the remainder of the season on the sidelines unless he and the team can come to terms on an injury settlement. Coley (hamstring) is active for Sunday's Week 4 tilt against the Saints. Analysis: Coley's presence will be particularly welcome on an afternoon where Cody Latimer (knee) will be sidelined. The second-year receiver will bump a notch on the depth chart to the role of No. 4 wideout while also presumably fulfilling his usual return duties. Coley (hamstring) is questionable for Sunday's game against the Saints. Analysis: Coley popped up on Friday's injury report with a hamstring injury. The severity of the depth wideout's injury remains undisclosed, but if Coley is sidelined for the Giants' Week 4 matchup, either Odell Beckham or Sterling Shepard could see work returning punts. Coley could have be active for Sunday's matchup with the Texans after Kaelin Clay (ankle) was ruled out, Dan Duggan of The Athletic reports. Analysis: Coley was claimed off of waivers by the Giants on Wednesday after being released by the Vikings earlier in the week. Although he's still likely learning the system, the second-year pro could suit up for the contest considering the Giants would only have four active wideouts without him. The Giants claimed Coley off waivers Wednesday, Ian Rapoport of NFL Network reports. Analysis: Coley was waived by the Vikings following their Week 2 tie with the Packers. He played four games for them last year as a rookie to go along with the first contests this season, but has yet to record his first career reception. He projects as a special teams contributor in New York, while also providing depth at receiver. Coley was let go by the Vikings, Courtney Cronin of ESPN.com reports. Analysis: Coley got time as a third receiver in last week's tie with Green Bay after Laquon Treadwell had three drops. However, Coley was waived when the Vikings signed Alrick Robinson, likely due to the $5.125 million the Vikings would suffer in dead money if they released Treadwell, Cronin adds. Coley could be signed and return to the active roster later this season. Coley played six snaps on offense but was not targeted in the passing game in Sunday's win over the 49ers. Analysis: Coley struggled with a groin injury in the preseason, so it was good to see him play in Week 1. He'll mostly play special teams, but he has a chance to take over as the No. 3 receiver if Laquon Treadwell struggles. Coley (groin) is expected to play in the season opener against the 49ers on Sunday, Courtney Cronin of ESPN.com reports. Analysis: Coley has been nursing a groin injury since mid-August, when he was carted off the field during practice. However, after a return to practice this week, it looks like Coley has been medically cleared to play. Coley is expected to primarily be used on special teams this season. Coley (groin) participated in Wednesday's practice. Analysis: Coley missed the final two games of the preseason due to a groin strain, Chris Tomasson of the St. Paul Pioneer Press reported. Coley appears to have returned to health in time for Sunday's season-opener against the 49ers, where most of the depth wideout's usage projects to be on special teams. Coley (groin) has made Minnesota's 53-man roster, ESPN 1500 am Twin Cities reports. Analysis: Coley missed the final two preseason games with a groin injury, but it must not be serious for him to make the 53-man roster. Coley will likely be limited to special teams, where he could be the backup punt and kickoff returner. Coley (undisclosed) isn't expected to suit up for Friday's preseason game against the Seahawks. Analysis: Coley has been sidelined for over a week after falling hard during practice Aug. 13 and being carted off the field. His absence will extend through Friday's preseason contest, perhaps impacting his chances of making the 53-man roster. Coley (undisclosed) is not expected to play in Saturday's preseason game, the team's official web site announced. Analysis: Coley came down hard after going up for a catch at Monday's practice and was carted off the field, but the details of his injury are unknown. Coley came down hard after going up for a catch at Monday's practice and was carted off the field, Dane Mizutani of the St. Paul Pioneer Press reports. Analysis: Coley is coming off of a solid preseason performance against the Broncos where he recorded two catches for 26 yards. The injury certainly did not look promising on first look, though further tests will ultimately determine its severity. Coley had two receptions for 23 yards on four targets in Saturday's preseason win at Denver. Analysis: Coley got work with the second-team offense and did more than Laquon Treadwell and Kendall Wright, who each had just one reception. Coley was thought to be an underdog for the third receiver role, but he may be more in the mix than first believed. Coley (groin) was back in pads at Thursday's practice session, Andrew Krammer of the Star Tribune reports. Analysis: Coley had missed the past week of training camp with a groin injury, so his return to practice is especially important with a roster spot far from guaranteed. The 2017 seventh-round draft pick received one target last season and did not record a catch, so if he ends up making the 53-man roster, he may be restricted to special teams work. Coley (groin) did not practice Sunday, Chris Tomasson of the St. Paul Pioneer Press reports. Analysis: Coley strained his groin during Wednesday's practice and has been sidelined since. The team doesn't believe it is a serious injury, but the less Coley is able to practice during this stretch of training camp, the more his chances of making the final roster decline. Coley strained his groin at Wednesday's practice and was held out Thursday, Chris Tomasson of the St. Paul Pioneer Press reports. Analysis: Coley's injury isn't thought to be serious and is expected to keep him out no more than a few days. He's on the fringe of the Vikings' receiver depth chart and will need a solid camp in order to secure a roster spot. Coley (coach's decision) is inactive for Sunday's game against the Bengals. Analysis: Coley is a healthy scratch for the sixth straight game and doesn't look like he'll make an impact for the Vikings down the stretch on either offense or special teams so long as the club avoids injury woes at wide receiver. 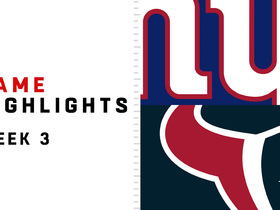 Watch the best plays from the Week 3 match up between the New York Giants and the Houston Texans.